As promised, a photograph of one of around 90 birds which made their way to the Mitchell today, joining yesterday's Rothesay Robins, so the Film Room is now adorned with 100 'burds' created by pupils. "Burds claim their freedom and I am for the burds," said George Wyllie and it seems the pupils of Rosshall Academy are too. We collected birds big and small from there today, and tonight we're featuring one of the large birds made by the S3 class, and inspired by Wyllie's Truce Goose. In 1993, his Truce Goose raised questions about disputes on Islay between farmers, conservationists and other islanders. Barnacle geese were prevalent at the time and to conserve their numbers, farmers were given compensation when the birds ate their crops. 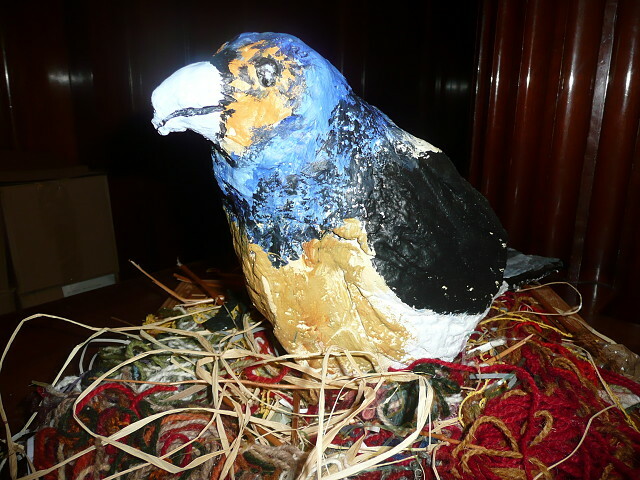 The bird symbolised the compromise between farmers and conservationists. George Wyllie positioned his 6m long and 5m tall goose - art you could not miss or ignore - on a lochan, alongside the road between the airport and Bowmore. He made it out of fence posts and fertiliser bags. He said he thought that the real endangered species was the native Gaels, the people of Islay, some of whom had to leave the island to find work. So, although not quite as big as the Truce Goose, the seven large birds which the pupils of Rosshall have made are also art you can't ignore. They're about 40-50cm and sit on their own nests or beaches, sea birds, and now they line the back of the Film Room, and when the DVD gets to the bit when George says, "Burds claim their freedom and I am for the burds", you can see the people looking at them and wondering. Good work, S3 Rosshall Academy!